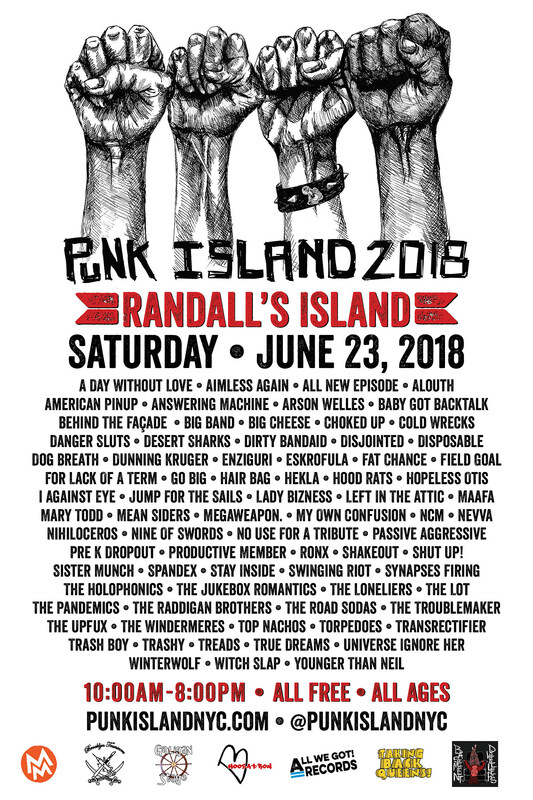 Annual NYC punk festival Punk Island returns on Saturday, June 23 and happens once again on Randall’s Island. The 2018 lineup includes Dog Breath, Sister Munch, Choked Up, Cold Wrecks, Desert Sharks, Lady Bizness, Nine of Swords, No Use For A Tribute, The Jukebox Romantics, The Loneliers, Trashy, and many more. Full lineup on the poster above. As always, the festival is free and all ages. It goes from 10 AM to 8 PM. More info here. Check out pictures from the 2017 edition of Punk Island in the gallery below. There’s also a Punk Island benefit show headlined by Sister Munch at Bushwick’s Cobra Club on May 5. The lineup also includes Dunning Kruger, Necrotic Society and Despair Wolf. $10 at the door gets you in.